The 40-year old hosted a charity day for RESPECT at Luttrellstown Castle less than two weeks ago and raised close to €35,000 for a cause that his dear to his heart. And after carding a career best, eight under par 62 to leap 51 places to tied 13th in Crans Montana, the Dubliner may well have a chance to make the €130,000 he needs to move into the Top 110 in the Race to Dubai who keep their cards with six events remaining after this week. "Divine inspiration I would say," said Lawrie when asked where his eight under par effort had come from. "I was lucky yesterday to make the cut. Holed about a 15 footer on the last to make the cut on the mark. I came out this morning and tried to shoot a low number and all of a sudden I holed a few putts and hit it in close." Lawrie held on to his card by the skin of his teeth with a brave performance in the final event of the season last year. But it's been an even bigger struggle this year and after missing 15 of 21 cuts, it was a pleasant surprise to see him make six birdies in an outward 30 and then birdie the 10th, 12th and 14th to go into the last three holes needing two birdies for a 59. "The magical 59 was on there with a few holes to play," said Lawrue, who bogeyed the par-three 16th. "Unfortunatley I didn't do that but 62 is a very good score." "I coud be at home watching TV at the moment but instead I am here and playing pretty decently," said Lawrie, who is seven shots behind leader Graeme Storm on nine under par. "I hit a lot of good shots in close today which makes it much easier." As for thoughts of keeping his card and his ranking of 189th in the Race to Dubai, Lawrie said: "Look, I have played rubbish until now. I am putting a few scores together so we'll see what the rest of the season brings. We'll go out tomorrow and see what happens. I am playing nicely and I have a little bit of confidence so we'll wait and see." If it was a good day for Lawrie, it was a lucrative one for Storm who had a hole-in-one on the 216-yard 11th and won a BMW sports car worth around €125,000. Playing alongside Shane Lowry, who shot a tow under 68 to go into the final round five shots behind on 11 under, Storm shot his second 64 of the week to lead by one on 16 under from Tommy Fleetwood. Storm looked set for a share of the overnight lead until Brooks Koepka double bogeyed the last to drop back to 14 under. Storm described his “total elation” at the ace, adding: “It was an incredible feeling. “I had a hole in one earlier in the season in Morocco and won a lamp, so I think this prize just about tops that one. “To win a car is absolutely magnificent, especially as I had to sell mine because we couldn’t afford to have two cars any more. Lowry was three under for the day through 10 holes but parred the next seven and then bogeyed the last. Gareth Maybin also finished with a bogey, carding a one under 69 to share ninth spot on 10 under, one ahead of Lawrie. Michael Hoey had two double bogeys in a 73 to slither down the leaderboard to tied 52nd. As for Pádraig Harrington, who had 32 putts for the second day running and is 73rd in the 82 strong field for putting, the 43-year old have three birdies and five birdies in a 73 to slip to tued 71st on one under. 216 J Jeong (Kor) 71 68 77. Gareth Maybin, Simon Thornton, Kevin Phelan and Peter Lawrie have two events to save their European Tour cards after missing the cut in the Portugal Masters. Grateful Lawrie in contention: "You know who your friends are when the ‘you know what’ hits the fan!" Peter Lawrie is hanging on to his sanity by his fingernails after a nightmare run that's cost him his tour card and more than few grey hairs. 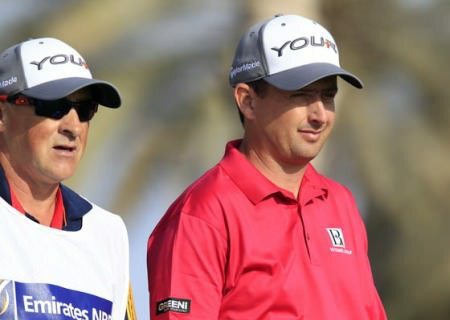 But after making just his ninth cut from his last 43 starts thanks to a second round 68 in the Commercial Bank Qatar Masters, his first thought was to acknowledge the support he's had from his friends during what's been 18 months of golfing hell. Peter Lawrie clings to his hope of wining back his tour card but it's an amateur who leads the Nordea Masters in the shape of 18-year old Marcus Kinhult. Peter Lawrie and his caddie Gerry Byrne in Dubai. Picture by Eoin Clarke/www.golffile.ieShane Lowry faces an anxious 10-day wait - maybe more - to see if he qualifies for the WGC-Accenture Matchplay. But Peter Lawrie remains in with a shout of claiming his second win on tour after a grinding, bogey-free 70 left him just four shots adrift of leader Richard Sterne, tied for 11th with Gareth Maybin (67) on eight under par in the Dubai Desert Classic.